Jim Matheson leads Morgan Philpot, while Peter Corroon is 27 behind Gary Herbert. Al Hartmann | The Salt Lake Tribune&#xA;&#xA;"I do not believe that there has ever been a time that a position I have taken has run counter to my religious faith," says Gov. 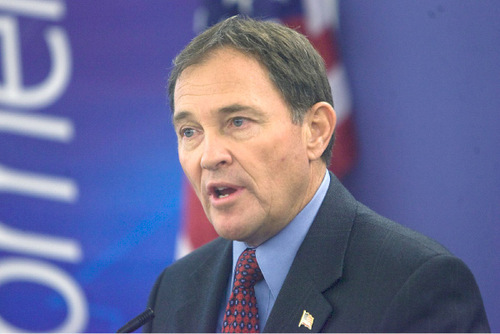 Gary Herbert. Francisco Kjolseth | The Salt Lake Tribune&#xA;Governor Gary Herbert, left, and gubernatorial candidate Peter Corroon get ready for their debate at the Eccles Broadcast Center on the University of Utah campus on Thursday, Sept. 23, 2010 before a live studio audience. 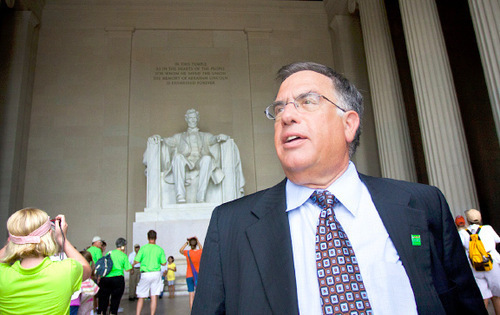 COBB CONDIE | Salt Lake Tribune File Photo&#xA;U.S. Senate candidate Sam Granato. 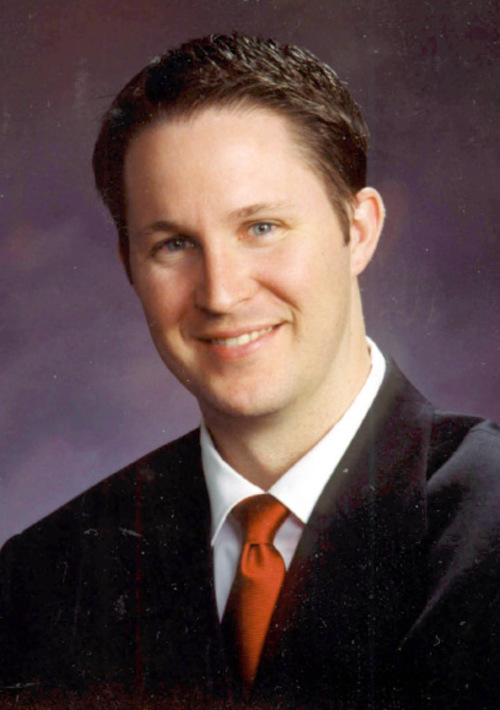 Trent Nelson | The Salt Lake Tribune "My beliefs will bolster, and never undermine, my commitment to the Constitution," says Senate candidate Mike Lee. "I believe that God has given mankind stewardship over the resources of this planet," says 1st District Congressional candidate Morgan Bowen. Salt Lake City - U.S. Rep. 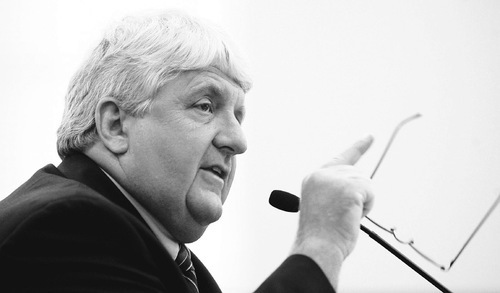 Rob Bishop talks to the Natural Resources, Agriculture, and Environment Interim Committee at the state Capitol on Wednesday about the damage that would be done to Utah if the Climate Change bill in Congress goes through. 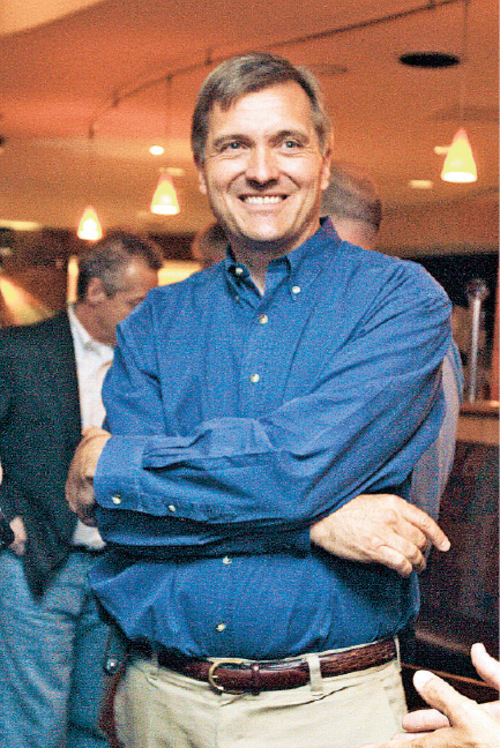 Photo by Francisco Kjolseth/The Salt Lake Tribune 8/19/2009 Leah Hogsten | The Salt Lake Tribune Rep. Jim Matheson "My religious beliefs play a part in informing my political decisions," says Congressional candidate Morgan Philpot. Paul Fraughton | The Salt Lake Tribune &#xA;&#xA;"Many people confuse LDS culture with LDS doctrine," says Karen Hyer, candidate for the third congressional district. 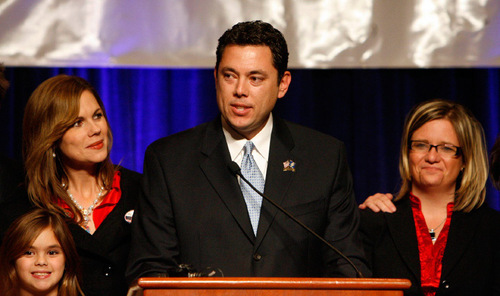 Newly elected congressman Jason Chaffetz is flanked by wife Julie and daughter Kate, 7, left, and campaign manager Jennifer Scott, right, as he addresses supporters during election night celebrations at the Utah Republican Party headquarters at the Grand America Hotel in Salt Lake City on Tuesday, November 4, 2008. 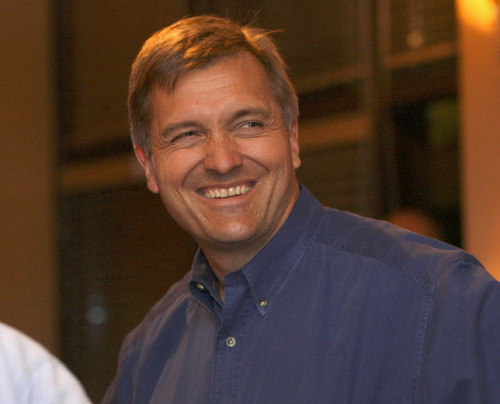 Steve Griffin/The Salt Lake Tribune "We have a moral obligation to raise our kids up and to leave this world a better place than we found it," says Rep. Jim Matheson. 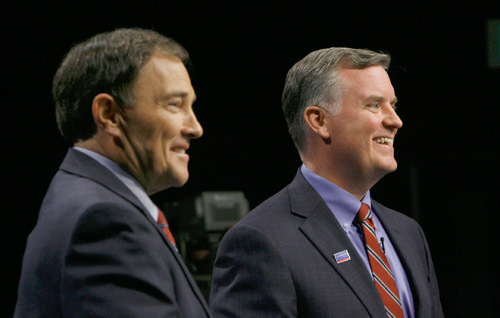 (Tribune file photo) Francisco Kjolseth | The Salt Lake Tribune&#xA;Governor Gary Herbert, left, and gubernatorial candidate Peter Corroon get ready for their debate at the Eccles Broadcast Center on the University of Utah campus on Thursday, Sept. 23, 2010 before a live studio audience. Republican Morgan Philpot is predicting a conservative tide will carry him to a win against 2nd District Rep. Jim Matheson. "I predict a win on Tuesday," Philpot said Thursday. "I think there's going to be a large turnout of very conservative-minded, independent voters who are tired of a candidate who can't run on his own record, but instead chooses to attack constantly." But a new poll for The Salt Lake Tribune shows that, while the conservative flood may have the water rising in the 2nd District, Matheson still enjoys a 13-point lead heading into Tuesday's election. "I think in the current political environment, to have a 13-point lead in the final week is a strong place to be," said Matheson. "But I'm going to be real aggressive right through Election Day because that's how I campaign." The Tribune poll, conducted by Mason-Dixon Polling & Research, shows Matheson with 48 percent of the vote to 35 percent for Philpot. Eleven percent are undecided. It's because of voters like Joseph Brooks that Matheson finds himself in a tougher battle this year. Brooks, 40, is a Republican from the southern Utah town of Washington who voted for Matheson twice before. Not this time. "It just appears that [Philpot] will be more consistent with what I believe," said Brooks, who didn't like Matheson's hedging on health reform, which he eventually voted against. "I have heard that when he voted on the health bill he did it late so he could vote how Utah wanted him to, but that's not really how he wanted to vote." There are few surprises in other poll results, with both Republican Gov. 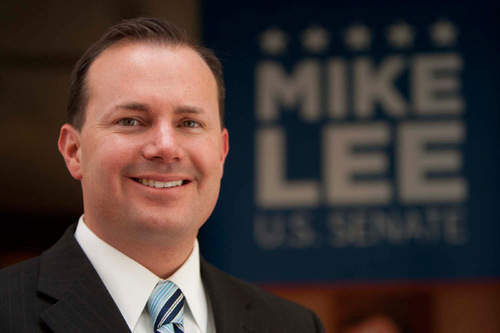 Gary Herbert and U.S. Senate nominee Mike Lee enjoying comfortable leads, although Lee's cushion is a mere 16 points. Philpot doubts The Tribune poll, but suggests a Matheson lead fits a liberal media narrative. He said his campaign has been making calls and found strong support and suspects Matheson has seen the same in his polling, prompting him to begin running television ads targeting Philpot's record in the Legislature. "Look at my opponent's behavior," Philpot said. "How do you explain that? How do you explain hundreds of thousands of dollars [in negative ads] from Jim Matheson of all people, the guy who's tried to tell us for 10 years that this kind of campaign is unacceptable." Matheson said he's not running the ads because he's worried. "I just think, in the current political environment, it's important for people to be very familiar with who the individual candidates are on the ballot," he said. J. Brad Coker of Mason-Dixon Polling said that Matheson remains under 50 percent, which is unfamiliar turf for him and risky for an incumbent, but the lead appears to be solid enough for him to survive the wave claiming so many of Matheson's Blue Dog Democratic colleagues. "I don't know if he's going to run up one of those 20-point wins like he normally does," said Coker. "There are a lot of seats in play that in normal years wouldn't be on the map. … If [Republicans] win Matheson's seat, it's going to be a bloodbath." In the race for governor, Republican Gov. Gary Herbert holds a 59 percent to 32 percent lead over Democrat Peter Corroon, the mayor of Salt Lake County. "Obviously these numbers are consistent with what we're seeing," said Herbert's campaign manager, Joe Demma. "I think at the end of the day, the direction the state is moving, we've weathered the great recession better than most other states, and I think people are giving at least some credit to the leadership of the governor." Corroon's spokeswoman, Stella Thurkill, said the campaign is remaining upbeat and "choosing to look at the glass half-full." 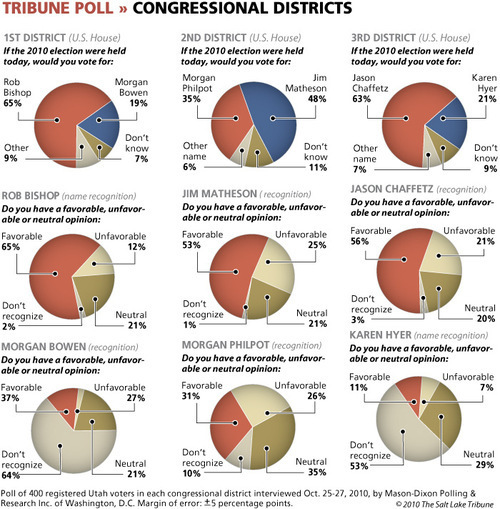 "The race is far from over and the latest Tribune poll is a snapshot in time. The only one that really matters is on November 2," she said. "Throughout the race, we know Peter Corroon has really been the underdog, but we're really encouraged by the thousands of people who have been involved." Corroon was suffering from a favorability rating of just 30 percent while 35 percent of those surveyed had a negative opinion of the candidate. In the U.S. Senate race, Democrat Sam Granato is trailing Republican Mike Lee by 16 points, 48 percent to 32 percent, with 15 percent still undecided. 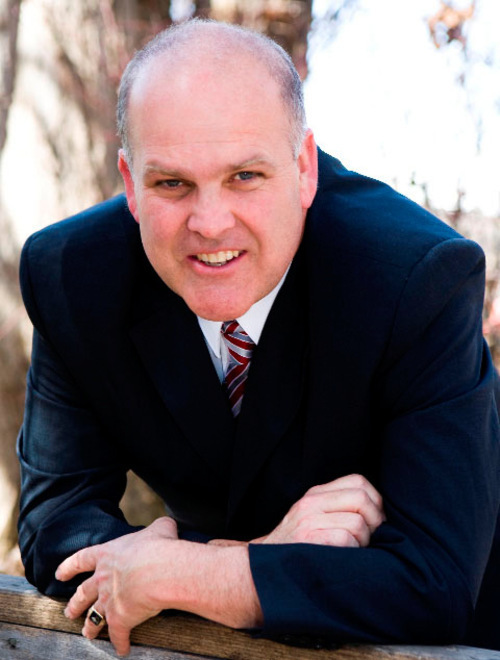 Constitution Party candidate Scott Bradley received 5 percent. Granato's campaign manager, Marla Kennedy, said the numbers were great news for Granato, and she thinks her candidate can close the gap by Nov. 2. "The poll says what we've known all along: The more the public hears and sees Mike Lee and hears what he has to say and hears his message, the more they dislike him," Kennedy said. Lee's unfavorable rating was more than twice that of Granato's – 27 percent to 13 percent – and Kennedy said voters are uncomfortable with Lee's extreme views. "We're more than happy with these numbers," she said. A spokesman for the Lee campaign did not return a phone message Thursday. 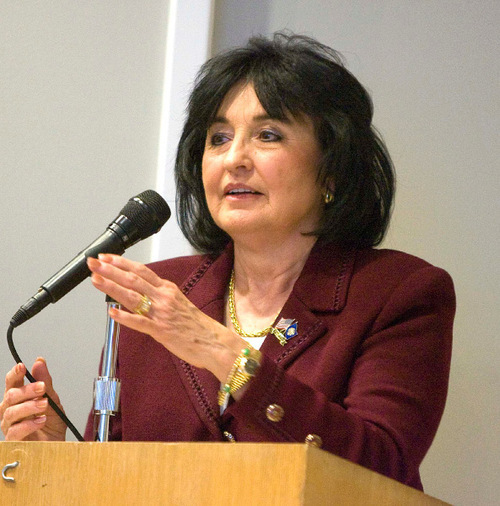 The Republican incumbents appear safely in control of the other two legislative races: Rep. Rob Bishop is leading Democrat Morgan Bowen 65 percent to 13 percent in the 1st District race and Rep. Jason Chaffetz is leading Democrat Karen Hyer 56 percent to 11 percent in the 3rd District contest. Mason-Dixon conducted the statewide survey of 625 self-described likely voters between Monday and Wednesday.